Home Fitness Yoga & Pilates Is Yoga Enough to Keep You Fit? In the strictest sense of fitness, yoga alone might not shed off that extra fat or help you train for a marathon. 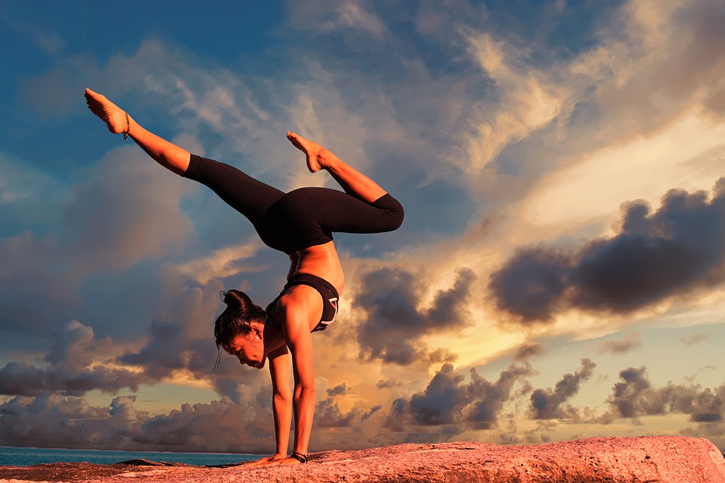 However, more studies are proving that yoga can help improve your fitness, especially if practiced at an advanced stage and at a faster pace. And, like most exercises, it’s not an overnight thing. It takes time, patience, dedication, and commitment. Your fitness results are greatly determined by the type of yoga poses you practice. In addition to that, your level of fitness as a beginner and how often you do yoga will give varied outcomes. One research shows that incorporating standing and balancing poses more in your regimen gives you better fitness results. When it comes to strength building, literally all yoga poses work on your muscles. Sun salutation, chair pose, and chattarangas are especially more engaging. While they may not give you more muscles compared to kettlebells, you’ll notice positive changes in your body. Plus, there’s always the bonus benefit of better balance, breathing, and full body control. Participants could perform more push-ups than when they were in the gym because their arms got stronger from doing yoga. Similarly, they developed abs without doing sit-ups which shows that yoga engages the core even more than a routine gym workout. Before taking up yoga classes, it’s important to know what your fitness goals are. For many people, toned muscles, flexibility, and stamina count as the perfect picture. For others, especially those engaging in various sports such as boxing, swimming, and athletics, incorporating other forms of exercise will prove more beneficial. The biggest advantage of yoga is the connection it creates between your body and mind. It addresses virtually all the muscles and helps you to work on them simultaneously. So, you should understand the difference between Bikram, Hatha, Ashtanga and Power yoga to determine a balanced workout that will give you the desired results. If your goal is to lose weight, yoga is one of the safest and effective options you have. Practicing yoga increases your heart rate and metabolic rate which in turn, leads to a high number of calories burned. Yoga might not be a high-intensity workout, but daily asana (poses) of a minimum of 30 minutes tones the major muscles groups as you stretch and lengthen, maintain balance postures and work on your core. Apart from burning calories, the weight-bearing postures work on your bones and joints keeping them healthy. Your body consists of several muscle groups that need to be toned. By taking advantage of Power yoga, you’re able to strengthen even the most neglected muscles. Since building your strength doesn’t rely on weights, you’ll learn how to coordinate the different muscles to maintain posture. This increases your body awareness and creates a deeper understanding of how your body works and moves. Other workouts involve repetitive actions which, if not monitored, could cause an imbalance in strength and pain in your muscles. The pain is caused by tighter muscles which pull at your ligament and joints. Yoga’s approach is subtle and aims at giving your muscles more pliability and strength without causing injuries. Asanas work on the muscles around your joints for easy rotation and mobility making your movements more fluid. With continued stretching that the various yoga poses provide, your body corrects muscle imbalances which is why it’s a great remedy for back pains. Yoga alone may not be sufficient to aid weight loss. According to the American Heart Association, moderate intensity cardiovascular exercise should take 150 minutes. Practicing yoga solely for as long as one week doesn’t meet those guidelines. On the one hand, while working out at the gym burns more calories, your bones, muscles, and joints undergo a lot of stress and pain. On the other hand, yoga works on all your muscle groups in complex gentle motions which stretch and loosen tight muscles and improves muscle strength and flexibility. In essence, combining yoga asanas with cardio workouts will definitely give you the most desirable results both internally (spiritually) and externally (physical form).